When Wanda Maximoff creates a world in which the heroes of the Marvel Universe are given their hearts’ desires, Bruce Banner finds acceptance in the ranks of an Australian aboriginal tribe. His newfound peace is disturbed when the House of Magnus invades the outback in search of the new minority: homo sapiens. The Hulk allies himself with A.I.M. in his conflict against the House, and eventually wages war against both in House of M: The Incredible Hulk. 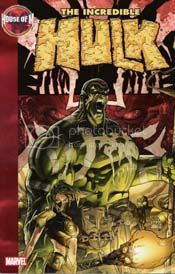 I didn’t nay-say as much as some when it was announced a slice of Peter David’s second run on Hulk would be devoted to Marvel’s "House of M" event. I’m just as cynical about the big, stupid crossovers as your most jaded fan (or jade juggernaut), but one of David’s strengths during his original run on Hulk was his ability to use the crossovers to his advantage and get great stories out of them. Prime examples include Hulk #384 when a Smurf-sized Hulk, shrunken by Thanos in Infinity Gauntlet #4, managed to dissuade Abomination from stalking his former wife by talking in his ear and telling the villain he was God; and Hulk #363 when he used the battle between Hulk and Grey Gargoyle to poke fun at the concept behind "Acts of Vengeance," while tying up something of a loose thread from the epic Grey Hulk/Pineapple Thing battle from the year before. In fact, while I’ve heard that David was unhappy about Bruce Banner being sucked into the "Heroes Reborn" universe post-Onslaught, I enjoyed most of David’s stories between the dawn of "Heroes Reborn" and the end of "Heroes Return." Also, I figured Hulk’s involvement in HoM might nudge greenie back into the Marvel mainstream, and I had no problem with that. Of course, to be fair, it wasn’t until after that announcement that we found out the Hulk’s foray into the HoM world would mark David’s last issues on the book. Unfortunately, the best phrase I can find to describe my reaction to the finished product is "lost opportunities." The story gives its main character five issues to join an aboriginal tribe, lead a revolt against an oppressive regime, assume leadership of a continent, turn on the group that helped him seize power, and finally try to recover after Scarlet Witch’s magics fade away. The story’s too big for its pages, and it feels far too rushed. There are some promising concepts in this story that could have been mined further, but there just isn’t time. The result is the only themes that are brought up are ones that we’ve seen before. The thing that I liked most about the story was the introduction of Banner into the True People Tribe, particularly because the premise of Scarlet Witch giving everyone in the MU their hearts’ desires raises some intriguing questions. The most obvious question is why Banner doesn’t find himself cured of his more violent alter-ego, and why Betty Banner is nowhere to be found. I don’t think this is a fault of the story, far from it. There are answers, but David doesn’t bring them to the foreground. The answer to the first question, I’d imagine, is that Scarlet Witch’s magic doesn’t just give Banner his heart’s desire, but the Hulk gets his dearest wish as well (and it’s unlikely that wish is to be eliminated). The absence of Betty is trickier, though a potential answer is that Banner wouldn’t be happy with Betty around if he’s still Hulk because it would mean she would always be in danger. Regardless, I feel like a lot of great stories could have been made simply out of Hulk's introduction into, and involvement with, the True People Tribe. We saw something like this in David’s first run, in Hulk #454, when a Savage Land tribe made the Hulk its champion. Though, this was when Banner was in the "Heroes Reborn" world, and that tribal Hulk only lasted one issue. With Banner back in the mix this time around, there are some interesting questions to be asked. Why is being a part of the tribe a manifestation of Banner’s dearest wish? Why would the True People allow him into the fold in the first place? Would Bruce find a love interest in the tribe? Post-HoM, if Banner were to find out that this was supposed to represent his deepest desire, would he feel guilty about the absence of Betty? Would he feel guilty about still being the Hulk? There’s a lot to explore with this concept, but David doesn’t go anywhere with it. It’s all but abandoned. Bruce gets some paint thrown on him and apparently learns how to use a boomerang. That’s about it. There’s a suggestion that Bruce has embraced a new kind of belief system, but besides a couple of lines of dialogue (“My satisfaction does not matter. It is what it is.”), we don’t see any of it. The House of Magnus element doesn’t make up for the loss of this richer concept. It lacks the subtlety in which Bendis framed the mutant-human oppression in House of M, and gives us a more black-and-white picture of the conflict. Exodus, the Governor of Australia, is a one-dimensional super-powered Hitler, and in the end he doesn’t even prove to be a worthy opponent. They really scraped the bottom of the bad-mutie-barrel for this corner of HoM. We get Unus the Untouchable, Pyro, and, God help us, Vanisher. 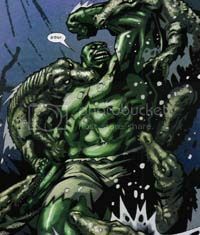 The Hulk has a tougher time with a pack of crocodiles than he does with Unus, and the battle between Hulk and the muties in Sydney is so short, most of it is off-panel. We don’t even know, by the end of it, if Pyro and Vanisher were even involved in the thing. There are some predictable battles between Hulk and a bunch of A.I.M. cyborgs, and a lot of disingenuous non-insight from Hulk’s villain/love interest, Monica Rappaccini. By the time it’s over, we learn that Hulk and Bruce aren’t as different from each other as they’d like to think, that they like being in charge, and that maybe Hulk’s better off left alone. Not really talking about uncharted territory here. P.S. For a great battle between Hulk, Unus, and the Blob, check out Marvel Fanfare #7. Great stuff. 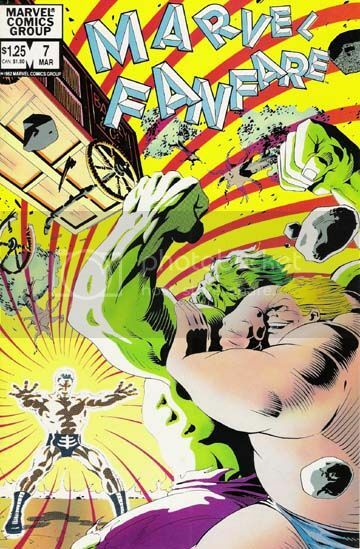 If you have, or remember, the 80's Official Handbook of the Marvel Universe, the pic in Blob’s entry of the Hulk lifting him out of the ground is from that issue.